What a beautiful bishop smocked dress by Claire & Charlie! 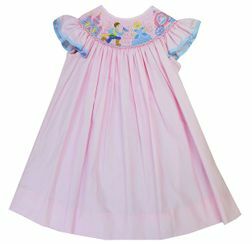 The dress starts with light pink fabric and has light blue gingham trim on the sleeves. 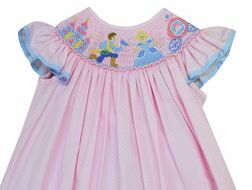 The bishop smocking is hand embroidered in pinks, white and blue with Cinderella's castle, Prince Charming putting the glass slip on Cinderella and her carriage to the right. Just beautiful for Disney trips and parties!